Folders are used to organize and group pages. Think of folders just like you would for your email inbox. You can use folders to group similar content. You can also create hierarchies of folders and pages. Note that folders that are empty or have no published content, will not be visible to end-users. Click on the New Folder button in the toolbar. Enter a name for the folder, and click outside of the text input to save the folder name. You can rename the folder any time by double-clicking on it or by right-clicking and selecting Rename. This allows you to hide the folder and all the items inside the folder. Only logged-in users will see hidden folders. To make a folder hidden, right-click on a folder then click Make Hidden. 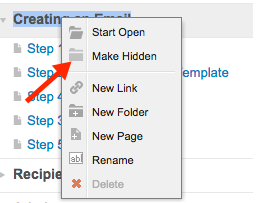 This allows you to show subpages or subfolders of a folder on page load. To start a folder open, right-click on a folder then click Start Open. Each folder and page in the table of contents offers a context menu (right-click menu). To access the menu, right-click on the page or folder. To access a folder's context menu, right-click on the folder. The context menu is only available once you are logged in to your ProProfs account. 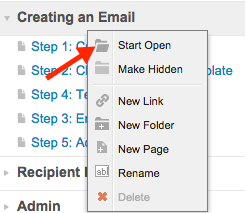 Start Open or Start Closed - This allows you to set whether a folder is open or closed by default. Start Open means that the folder will load open. Start Closed means that the folder will load closed. Make Hidden - This allows you to hide the folder and all the items inside the folder. Only logged-in users will see hidden folders. New Link - This will create a new link at the location of the click. New Folder - This will create a new folder at the location of the click. Rename - This will activate a text input for you to rename the folder. This looks the same as when adding a new folder. Delete - This will delete the folder. Only empty folders can be deleted. Select this option if you want empty folders to be hidden when logged out. Folders will hide if there are no published pages inside of it. This is ideal when you are working on new content and your folder only has draft pages inside of it. Once you publish the pages the folder will automatically appear. Select the site you want to show empty folders. Uncheck Hide empty folders logged out.